One week ago we learned that the CW had picked up "Arrow," a new television series based on DC Comics' "Green Arrow" for a pilot with Greg Berlanti, Marc Guggenheim and Andrew Kreisberg writing and executive producing. Today, The TV Addict has gotten their hands on the casting breakdowns, which offer a few clues as to what fans can expect if the show makes it to the small screen. Justin Hartley previously played a television version of the character on "Smallville", becoming a regular cast member in later seasons. Hartley is not being sought to play the role at this time and it appears that the show will not have any specifics connections. Was ist DAS? Keine Mädels-Serie dieses Mal? Naja. Hört sich nicht so wirklich interessant an für mich.
Ist mir unverständlich warum man nicht Hartley nimmt und die Serie als Smallville Ableger konzipiert. TheCW sucht doch händeringend nach Smallville 2.0. Die News ist aber schon nen bissl älter. *gg* Egal, ich bin auch nicht so erfreut darüber. Ist mir unverständlich warum man nicht Hartley nimmt und die Serie als Smallville Ableger konzipiert. Ja geht mir genauso. Ich hätte mich eher um ein Spin Off alla Metropoilis mehr erfreut. Aber das wird wohl niemals passieren. Nun ja, ich war eh nie wirklich ein Green Arrow Fan, also werde ich da auch sicherlich nicht rein schauen, falls das Projekt in Herbst aufgenommen wird. Ich hab gelesen, sie wollten kein SpinOff von Smallville, da ja dann alle erwarten würden, dass Clark ein Besuch bei GreenArrow abstattet. keine Ahung was das sollte, aber ich hätte mir die Serie mit Justin angeschaut.. In addition to confirming Oliver Queen's shipwreck origins, the characters listed below include Dinah Lance, known to comic book fans as Black Canary. Though there's no confirmation of whether her superheroic alter ego will be featured on the show, its a very likely possibility. A 27 year old reformed bad boy, who after having spent five years shipwrecked on a tiny, brutally dangerous island in the South China Sea returns to town a different man. Or to be more specific, a tortured, thoughtful master of the bow with a ferocious determination to make a difference. Dating all the way back to 1941 when he made his first appearance in "More Fun Comics" #73, Oliver Queen is a billionaire who leads a double life as expert archer and costumed hero Green Arrow. Over the years, Queen has been a member of the Justice League and even Mayor of his hometown, Star City. obwohl auf theCW? Na....mal sehen. Willa Holland will play Thea Queen, Oliver’s celebutante younger sister who’s testing the boundaries of acceptable behavior. SUPERNATURAL's Katie Cassidy will play Laurel, a young legal clinic attorney who shares a romantic past with Oliver in the CW's Arrow pilot. Susanna Thompson is Oliver’s mother, Moira Queen. David Ramsey is John Diggle, and Stephen Amell plays the title role. The fall TV season is taking shape. Networks have ordered dozens of new pilots starring familiar faces including Zachary Levi, Mindy Kaling, Mandy Moore and Sarah Silverman, and from proven producers like Josh Schwartz, J.J. Abrams, Greg Berlanti and Kevin Williamson. Also making a comeback this year: Iconic characters including Green Arrow, Carrie Bradshaw, Sherlock Holmes and Beauty and the Beast. 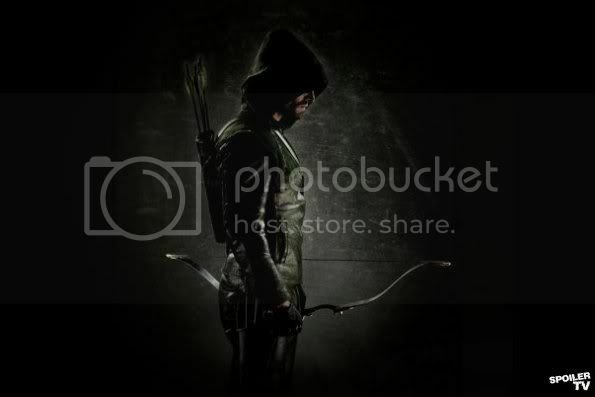 Hung's Stephen Amell stars as DC superhero Green Arrow in this modern retelling of the legendary archer's adventures. Brothers & Sisters' Greg Berlanti and Marc Guggenheim will executive-produce with The Vampire Diaries' Andrew Kreisberg. Katie Cassidy, Willa Holland, David Ramsey and Susanna Thompson will also star. The Complete Pilot Report: The CW's Got Green Arrow and Carrie Bradshaw! liest sich okay, aber ich fürchte das wird nicht so dunkel wie ich es gerne hätte, mal schauen. Die anderen Neustarts...autsch, ist eher nichts für mich.
Gefällt mir! Danke für's posten AIC! Zuerst war ich ja nicht so angetan davon, dass Justin nicht Green Arrow spielt, aber der Trailer sieht gut aus, auch wenn er nicht viel aussagt, klar. Scheint so, als würde man auf die Trickarrows (Boxhandschuhpfeil usw.) verzichten, das hat doch schon mal was. Black Canary und nicht nur als Dinah Lance. Wow... lecker der Typ, definitiv. Ich hatte auch erst meine Bedenken, weil ich in einigen SV-Folgen Justin Hartley als Arrow gesehen habe, aber der Neue sieht gut aus, fit und ein wenig finster. Sieht ganz nach einer Serie nach meinem Geschmack aus. Jetzt da es zusammen mit Supernatural am mittwoch laufen wird, werd ich auf jeden Fall mal einen Blick riskieren. Auch nicht schlecht. Ich glaube ich muß ab Herbst Donnerstag immer seeeeehr früh aufstehen.